Turn-back Tuesday! Is that even a thing? If not, I just made it up! I didn’t have anything new that I can share with you right now, so I thought I’d share a project from this time, last year! Last year I did several craft fairs, and I made some 3D projects to sell. Today I thought I’d share the decorations that can be used for your dining table, mantle, or just about anywhere else. A trip to the dollar store can be very fun! It’s where I found the wine glasses. Since I wasn’t planning on using them for wine, I didn’t want to spend a bundle on the glasses. I love that the Home Sweet Home Thinlits have carried over from last year’s holiday catalogue! You can find them in the Annual catalogue, now. Along with the Sweet Home stamp set, you can create some fun & cute 3D home decor. First, I assembled the gingerbread house from Crumb Cake cardstock. I used some Glimmer Paper in Sweet Sugarplum that retired after last holiday; it would look just as cute to replace the Sweet Sugarplum with the Real Red!. Decorate your house how you like. I used a combination of stamped images from the Sweet Home stamp set, and die cut them with the Home Sweet Home Thinlits. I then used the largest scallop circle I could find, that would fit under the wine glass, and used Tear & Tape to attach the bottom of the house. It’s best to test out where you house fits best – generally, the middle is the highest point in the glass. First I turned the wine glass with the opening to the top, and added some fake snow (from the dollar store). Then, I ran a bead of E6000 liquid adhesive around the rim of the glass, and inserted the gingerbread house upside down, attached to the scallop bottom. I used the E6000 because it’s specially made to bond to non porous surfaces, like glass and metal. I didn’t want my decor piece falling apart! After the adhesive had dried, I attached a length of (retired) gold glimmer ribbon around the bottom of the glass, to cover the join. I then tied a bow with the same ribbon, around the stem. It was fun creating these, even if it was a little fussy! I made several, in different colours. Here’s one I created with red. This wine glass was not as wide, and it had a green coloured stem. So I decided to pair it with the red, for a classic Christmas look. 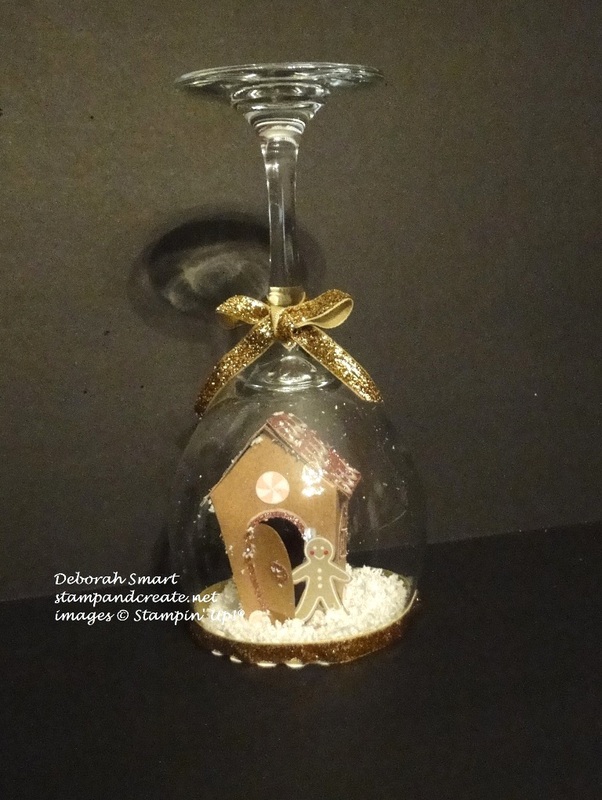 These little gingerbread houses also make adorable ornaments for your Christmas tree! 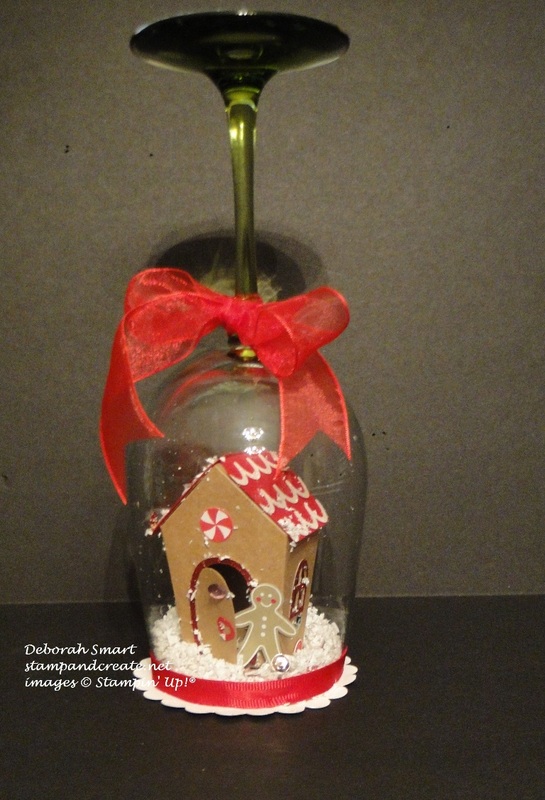 Use your own creative genius, and whip up some of your own ornaments and decor this holiday season. They also make terrific gifts for your friends and family. The wine glass decor would be appreciated by any hostess! Click on the product images below, or my signature, to shop in my online store. It’s open 24/7, so you can shop whenever it’s convenient for you. Next Next post: How Is Your Tic Tac Toe Game? Deb, this is SOOOO cool and your directions are really great. Such a neat Christmas decoration. This is so cool, Deborah! I love the “Turn-back Tuesday” idea. I may borrow it. Great decor piece! Funny you should mention Cher. That song started going through my head when I saw you Turn Back Tuesday post! I love the glass ornament. It is adorable!